Grandson Michael plays Man #3 is his schools musical production. Annie. Laura and I got to see him on stage Friday night. We had a great time. For $1 you could get a flower and write a congratulatory gram attached with a ribbon. The vase holding the flowers was a wedding gift from my friend Vincie, Erika reminded me. If this doesn't evoke another time, I dom't know what does! he bakes). 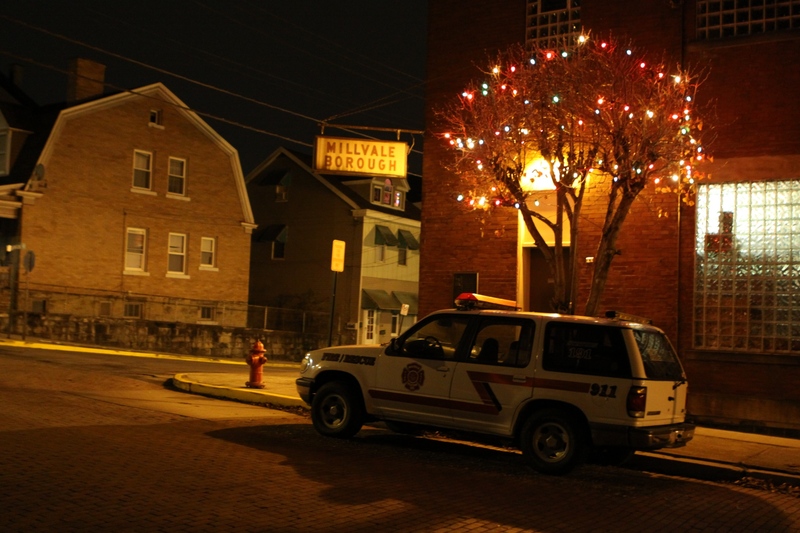 Saturday night was the Big Love Art Show at Panza’s and as we left to get into the parked car, I saw this scene outside the Millvale Borough Building. Several of the buildings have water line marks from the years the town has flooded. Waiting for Steve to pick me up in the turnaround, I saw the pattern on the concrete. I had just viewed Waiting for Superman. I was in a good discussion group after the film. 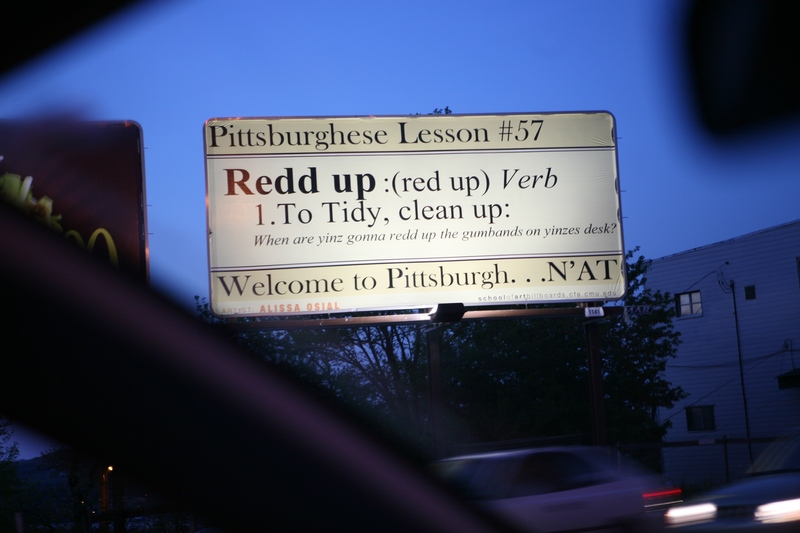 You can read an editorial piece by Tony Norman from the Post-Gazette my friend V told me about. Lots to think about. There wasn’t much in it that was hopeful or positive, especially when it comes to public education. In fact , it was downright depressing to me.There are a ton of reviews at Rotten Tomatoes if you want to see the splats, too…. 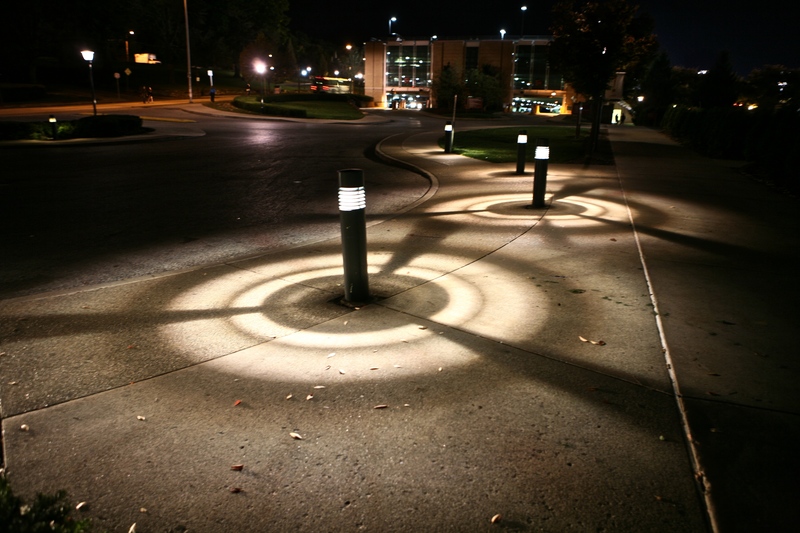 But getting back to the patterns of light and shadow on the sidewalk while I was waiting for Steve…. Looked like a good target for a spaceship landing. From the Archives Oct 2008. Pre-blog era. 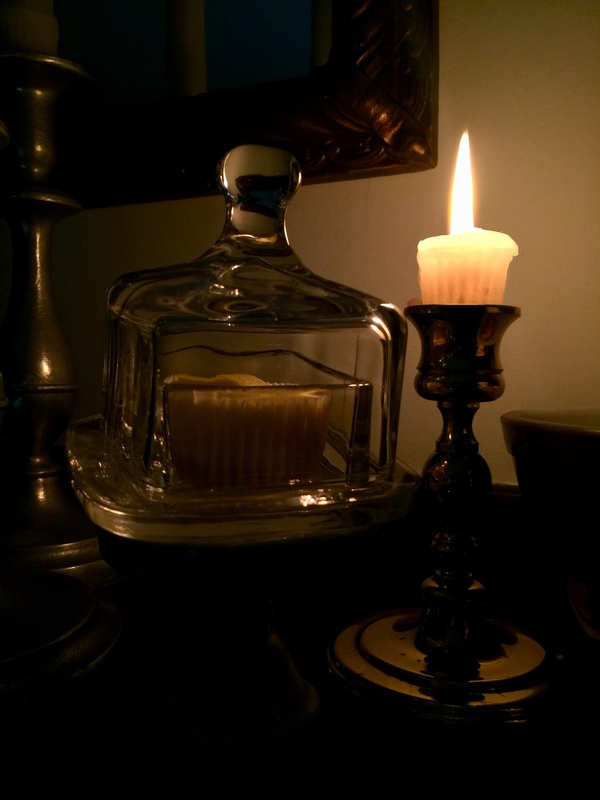 Artist Lucette de Rugy created Artlumiere. 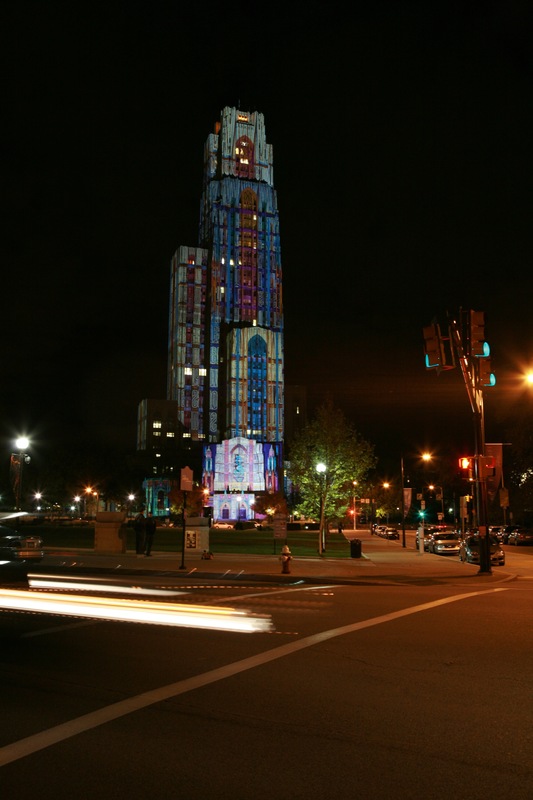 See how she transforms the University of Pittsburgh Cathedral of Learning into a a shining tower of lights and patterns. It was stunning. Always practicing night photography. Capturing available light. Some car headlights give a clue as to how long the shutter was open. Received a comment from Gail yesterday that the triangular building downtown reminded her of Shalit’s Drugstore in Morristown where we went to HS. 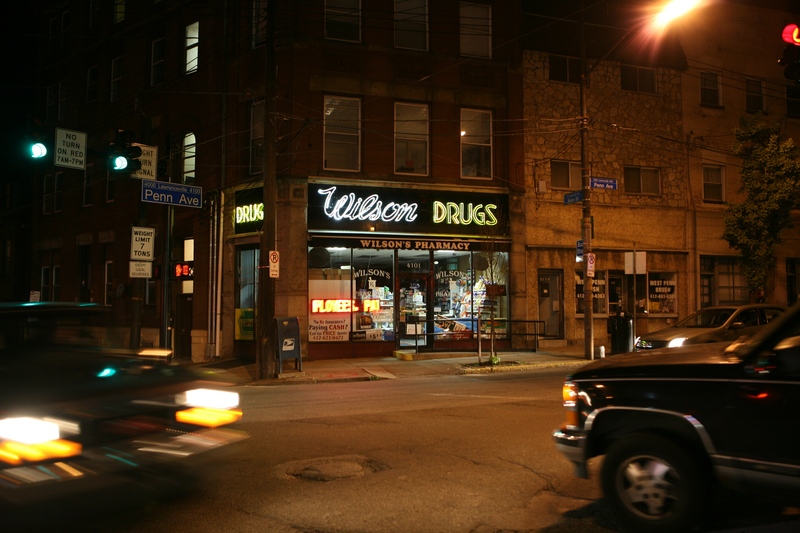 So when I saw this corner drugstore tonight on the way home from the All City HS Art Showcase, I stopped to photograph it. Looks like I’m in the middle of traffic. Camera propped against a light pole, cable remote. Seems the CVS, Eckerds, Walgreen’s eat up all the independents but this one’s still open in Bloomfield on the corner of Penn Ave and Main St.
A busy corner, a block from the new Children's Hospital. Do You Redd Up Where You Live? The Allegheny River to the right, flowing under the bridges. And leaking onto the road. This section of road has been in several movies filmed in Pittsburgh. Sunday night so not much traffic. Hopped out at the end of 7th Street Bridge. Caught the roadsigns’ reflection. Not deep but flooded with Allegheny River water. 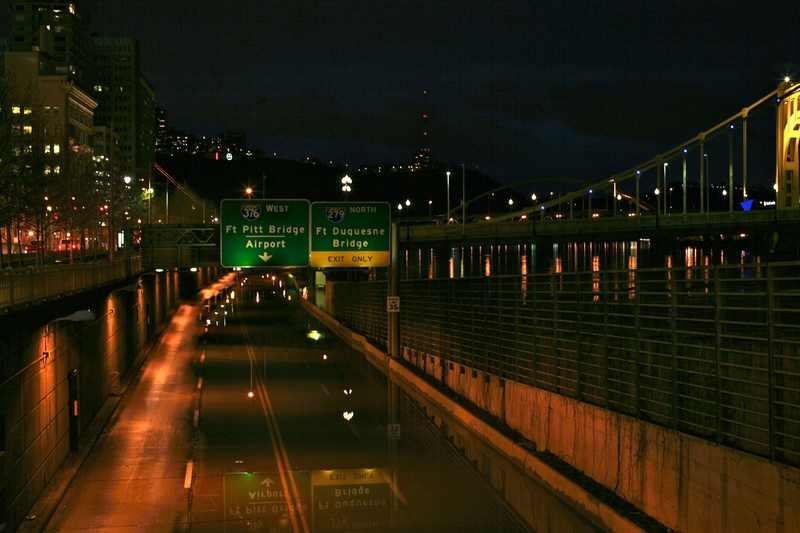 Roberto Clemente Bridge on the right.